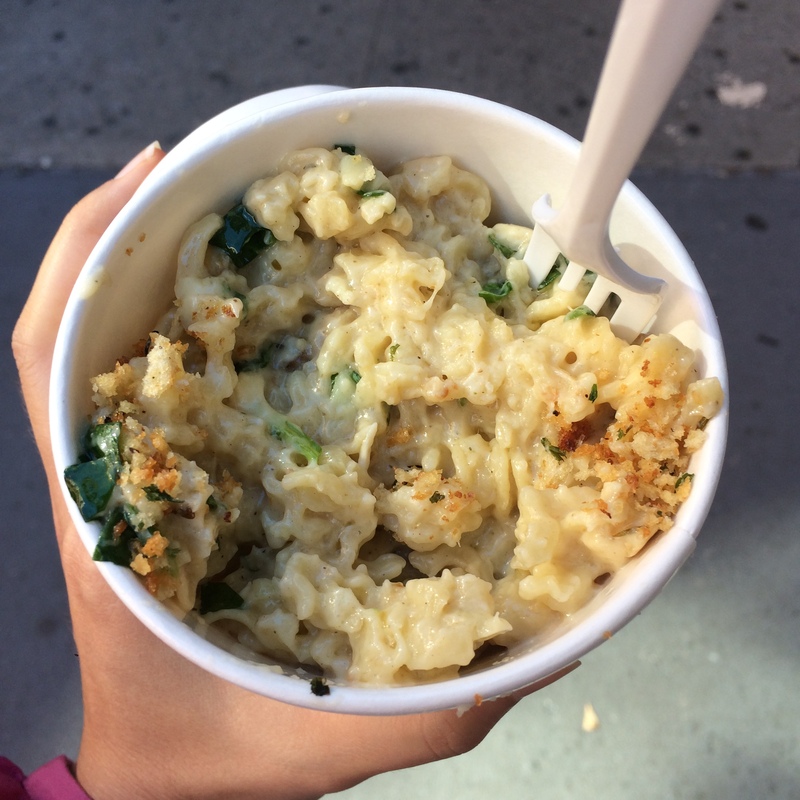 Living in Greenwich Village means I don’t trek up to the Upper East Side much for lunch, but I will gladly walk the 70+ blocks north for E.A.T.’s macaroni and cheese. This mac strikes the perfect balance between creamy and cheesy. The sauce itself is thick and rich, like any good bechamel, but there’s also a ton of melted cheese in the dish, which makes for a nice textural balance. The cheese blend itself is made with many different varieties, but the Swiss shines through the most (though there’s a nice Gouda and Parmesan kick as well). A delicate sprinkling of breadcrumbs completes the dish, giving a little crunch to the top layer of noodle. As you can see from the photo, this mac is made with penne, an excellent choice as the shape can hold sauce in its hollow as well as within the ridges on the outside of the pasta. The penne in this dish is cooked beyond al dente, but the soft pasta paired with the decadent sauce just makes it more comforting, in my opinion. Al dente penne sometimes doesn’t hold cheese sauce as well, anyway. Side note: E.A.T. does all carb and cheese pairings well: the grilled cheese here is one of the best in the city. Sorry for the delay, everybody! I popped out a baby in February. The Clocktower is a beautiful restaurant just off Madison Square Park, inside the New York Edition hotel. It is certainly one of the fancier establishments in this city to carry a macaroni and cheese, so I was understandably intrigued to give it a spin. As you can see from the above photo, this is not a traditional M&C. The sauce is just barely slicked on and the pasta is complemented by wild mushrooms and slow-cooked ox cheek. Delicate shavings of Parmesan complete the pretty plating. Was it tasty? Yes. Would I classify this as a true mac and cheese? The jury is still out on that; it’s certainly creamy, but not really cheesy. The sauce tastes more like a bechamel than a mac sauce. But, the next time you’re looking for a hearty, rich pasta dish, you could do worse than this lovely preparation. I think French-style macaroni and cheese is definitely a category all its own. The sauce is usually thinner than American versions and it almost always is finished with a few seconds under the broiler. “Le Mac & Cheese” at new spot Maison Hugo is no exception and might even be the textbook version of this variation. Here, the mac is doused in Mornay sauce (like a Bechamel but with shredded Gruyere and egg yolk added), mixed with Emmenthal and Parmesan cheeses, and studded with French ham. Even with the Mornay, this is on the lighter end of the mac and cheese continuum. The pasta and ham are only lightly coated with sauce and cheese, so this isn’t a gut-bomb of a dish. Plus, the portion is fairly small (but not too small), so you can polish it off and feel satisfied without getting rolled out of there. My personal preference is for a slightly gooier mac, but the blend of ingredients in Maison Hugo’s version make it a very solid dish. The saltiness of the ham mixed with the light Mornay is a very French and very tasty combination. Most people have a love/hate relationship with the Union Square Holiday Market, but there is no denying that they have upped their food game in recent years. You can nibble on everything from Momofuku Milk Bar cookies to Sigmund’s Pretzels as you peruse dozens of booths of ornaments, artisanal salts and vintage posters. This year I discovered the two tablespoons booth, which is located in what might be called the food court area of the market (near the George Washington statue). I saw someone carrying one of the cardboard bowls of mac a few booths away and followed the smell of cheese until I found it. While the owners don’t have a brick and mortar in New York, they sell at various markets around the city and will even cater events. The booth seems to be selling at least two types every day: smoked Gouda and paprika, and goat cheese and rosemary. Since smoked Gouda might be my absolute favorite mac cheese, I obviously went for that. They top it with a sprinkling of panko right before serving, but otherwise this is a stovetop mac recipe (no baking, no crust). While the paprika had a nice spice kick, I wanted more smoky flavor from the Gouda. But, I enjoyed how creamy the sauce was and I polished it off in minutes. I’d request it without the panko though; I think a breadcrumb topping is really only necessary when it’s a baked mac, otherwise it’s just kind of flavorless crunch. That being said, this is a pretty perfect snack while you’re making your way through the market and, as I’ve mentioned before, there are hardly any places that make tasty grab-and-go mac. Plus, it’s only available until the market closes up shop around Christmas, so try it soon! Heidi’s House is a place that has been on my radar for years, but because of its location (far, far away from downtown), it wasn’t until this week that I finally made it uptown to check it out. I wasn’t the only one with a craving for winter dishes that night: even at 6 PM the wait was almost an hour. Part of this, of course, has to do with the fact that the restaurant is tiny, but you can definitely attribute a large part of its success to its macaroni and cheese. Almost every table had an order, which is served adorably in the clay pot pictured above. So, what sets this place apart from others? The attention to detail. Not only does HH use solely organic cheese in their mac, but they make each one to order. There’s a helpful note on the menu that the dish will take about 25 minutes to cook, so you can request it for your main course while still deciding on your appetizers. It arrives, bubbling (please do yourself a favor and wait a few minutes for it to stop steaming before you dig in! ), and perfuming the air with its wonderful mix of cheddar, mozzarella (underused mac cheese!) and parmesan. You can opt for various mix-ins; I went for broccoli, but the bacon seemed to be the most popular. There’s a wonderful crust, thanks to the combo of the mozz and parm and the interior sauce is more cheesy than saucy; this is the kind of mac that will have strings of cheese hanging off your fork as you reach for a bite. As for the flavor, this is lightly seasoned, the cheese blend is really the star here. My one complaint was the noodle: HH uses the rotini, which is fine as a mac-scooper, but it was just a tad overcooked. Is it destination worthy? I would say it’s neighborhood destination mac, but not quite as awe-inspiring as some of my other hands-down favorites. You may recall that I’ve already covered Murray’s mac and cheese in a previous post, but this post refers to the grab-and-go variety (not to be confused with the refrigerated take-and-bake!) that you get at the cheese shop, not Murray’s Cheese Bar, the restaurant. Murray’s Cheese is my happy place. It is conveniently located halfway between my gym and my apartment, which means I NEVER have to go hungry on my walk back. I’m here at least a few times a week, picking up snacking cheeses, cheese for recipes, yogurt for breakfast, and, occasionally, chocolates and caramels. And, since I’m convinced that mac and cheese is the ultimate pregnancy superfood, I’ve been frequenting this spot even more than normal. Many people don’t even realize that the shop has hot food. Apart from selling cheese, Murray’s actually has a dedicated grilled cheese counter (which, by the way, makes some of the best breakfast sandwiches in the city). In one corner of this, you will find their mac and cheese operation. You choose your size and your mix-ins, they stick it under a broiler to get nice and bubbly, and finally they hand it over to you in a portable paper cup. The whole process takes just a few minutes. 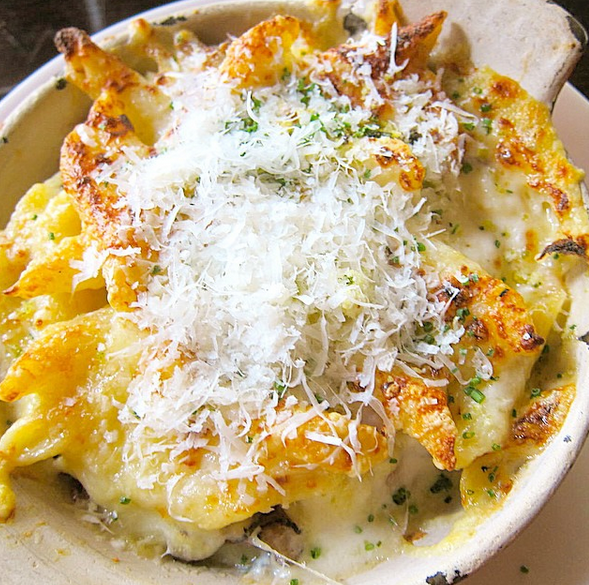 Note: you CAN’T choose your types of cheese or pasta, but, they’re cheese experts; they know what they’re doing. While their exact cheese blend is proprietary and a closely-guarded secret (I believe it’s the same as at the restaurant), it’s rich and nuanced; you definitely taste a mix of sharp, nutty and creamy cheeses. As you can see in the picture, Murray’s uses radiatori, which picks up a lot of the thick sauce. I opted for chicken and spinach as my mix-ins, which were tasty, but I would have liked a little bit more of each. Each finished product also gets sprinkled with a dusting of breadcrumbs, which lends a nice little crunch. My major reason for loving this mac — apart from the fact that it tastes good — is that I don’t know any other place that’s churning out high-quality dishes like this while still making them portable. Sure, there’s S’MAC or Macbar, but you can’t really walk and eat those; even if you do order them as carryout. Plus, if you eat it after a workout, there are no calories. That’s just science. You guys! Exciting news! We have a new member of the highly-elite destination mac club. Everyone, meet Almond‘s macaroni and cheese. This mac fires on all cylinders for me: its sauce is very rich and creamy without being one-note, the pasta is not too soft, and, as an added bonus, it has truffles and prosciutto. Generally I like my mac virgin, if you will, but the truffles and salty bite of the prosciutto really worked well for this dish and made it way more multi-dimensional. I also enjoy any mac that takes a spin under the broiler (especially when it’s in an adorable ceramic ramekin), there’s nothing like digging into that crust. If I have one criticism, it’s that I don’t love penne as a mac shape. Plenty of my favorite spots use it, but I find that the standard elbow makes for a much better pasta-to-sauce ratio. Regardless, this place is absolutely worth a trip. And the portion is big enough that, if you’re not almost six months pregnant (hiyo), you can definitely share.